Pope Francis has appointed Kornelius Sipayung O.F.M. Cap as the new Archbishop of the metropolitan archdiocese of Medan on 8 December 2018. He will continue the leadership of Msgr. Anicetus Sinaga whose retirement request was accepted as he had passed the age limit of 75 years. Bishop-elect Sipayung will be ordained a bishop on February 2, 2019, to coincide with the feast of Presentation of Jesus at the Temple. The Apostolic Nuncio for Indonesia, Titular Archbishop of Torcello, Piero Pioppo will act as the principal consecrator. Sipayung was born in Bandar Hinalang, Purba, Simalungun , North Sumatra , Indonesia on 26 August 1970. He underwent the novitiate at the Capuchin Convent of Pematang Siantar and was educated at Christus Sacerdos Minor Seminary, Pematang Siantar. He undertook further studies at the Saint John College of Philosophy and Theology, Pematang Siantar. On August 22, 1998, he made the perpetual vows as a member of the Capuchin Order in the Province of Medan. Sipayung was ordained a priest on December 11, 1999 by Archbishop of Medan, Msgr. Pius Datubara O.F.M. Cap. Following his ordination, he received his first assignment at the Assumption of the Blessed Virgin Mary Parish, Kabanjahe , Karo District . In 2002, he continued his study in the field of dogmatic theology at the Pontifical Gregorian University in Rome and also attended English language training in Brisbane, Australia. Upon his return to Indonesia in 2005, he served as a formator of Capuchin seminarians in Pematang Siantar and lectured at St. John’s College of Philosophy and Theology in Pematang Siantar until 2015. In 2015, he was elected as Provincial Minister of the Medan Capuchin Order. Sipayung is only 48 years old and is a member of the collaborating group of Indonesian Capuchins to foster cooperation amongst the Capuchin Order of Pontianak and Medan Provinces, as well as being a Custodian for Sibolga and Nias provinces. He also performed similar roles in his capacity as a member of the Pacific-Asia Capuchin Conference (PACC). At the national level, he is a member of the Theological Commission at Indonesia Catholic Bishops Conference. At the diocesan level, he is a member of the presbyteral council and serves as an administrator for the Harapan Jaya Foundation and Catholic Charities. His coat of arms as a bishop consist of a shield that is divided into three section horizontally. The top section with a red background has the icons for a dove, white star of Bethlehem and the Lamb of God. These three icons reveal the mystery of the incarnation and forms the basis for the theological ideas of Sipayung. The center section contains the Franciscan emblem as the background to reflect his membership in the Order of the Capuchin Brothers, in the form of two arms crossing between Jesus’ right arm and the left arm of Saint Francis of Assisi, with the stigma (scar) of Christ on the palm. 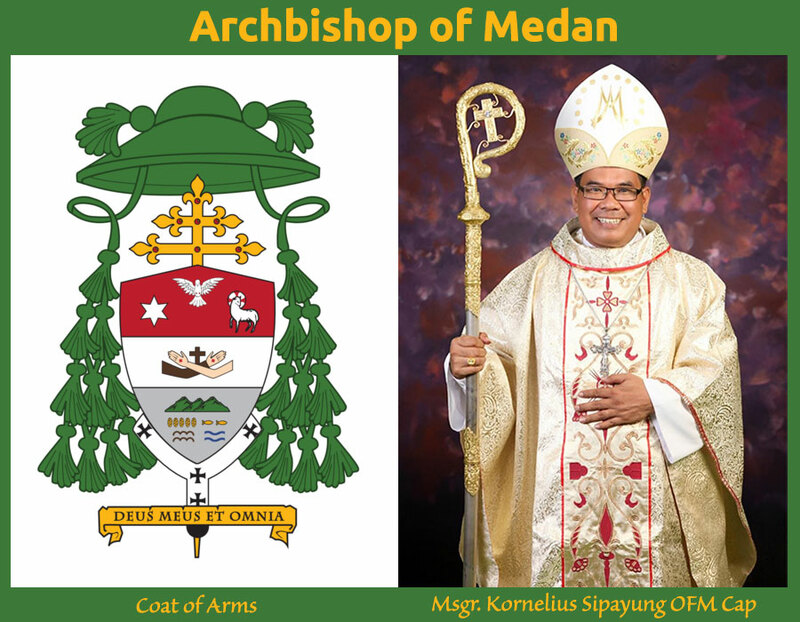 At the bottom section is the symbol of his birthplace and the location of his pastoral work in Medan Archdiocese with icons representing Bukit Barisan, Lake Toba, agricultural land, and also five loaves and two fish, which means the produce of the earth and also the Eucharist . The shield is framed with a green pontifical hat called a galero with 10 tassels per side and processional cross above the shield with two bars to indicate an archbishop. The pallium a symbol of his authority as a metropolitan Archbishop symbolizes union with Peter. He took the motto “Deus meus et omnia” which means ” My God and my All” is a prayer of a mystic in ecstasy as a symbol of awe in the silence of the mystery of the work of creation and the work of redemption. This also becomes a recognition of man’s powerlessness before God. We welcome and pray for the success of the ordination events. The first event on Friday 1 February 2019 at around 5 pm will be the Solemn Benediction at the Cathedral Church in Medan. This event is expected to last for one and half hours and will be attended by the Vatican’s Apostolic Nuncio and around 34 bishops from Indonesia. After the mass there will be a reception held by the Governor of North Sumatra, Edy Rahmayadi at Dinas House. The second event on Saturday 2 February 2019 is the episcopal ordination of the bishop which will be held at Gedung Serbaguna Pemprovsu, Jln. William Iskandar, Pancing, Medan. This event will start at 5.00 pm and about 14 thousand faithful are expected to attend the four hour long event. The third event on Sunday 3 February 2019 at around 9.30 am at the Cathedral Church Medan will be the Stasionale mass which is the inaugural mass of the new bishop. All are invited to participate in his Episcopal Ordination.